There is this quote I think of often when I am in my "9 to 5" mode. It's a famous saying by John Muir and when I'm stressed out at the office or packing my bag for a much-needed weekend away in the woods, it pops into my head. After the chaos of the holidays and the madness of those last few months of 2018 (she was a doozy) this is exactly how I was feeling. Tired, nerve-shaken and much too over-civilized. Cabin fever was setting in and I needed to escape my house on the shoreline for a cabin in the woods. I get that itch, that itch to be anywhere but home, to explore somewhere new. I need to go find those mountains, lakes, and streams. 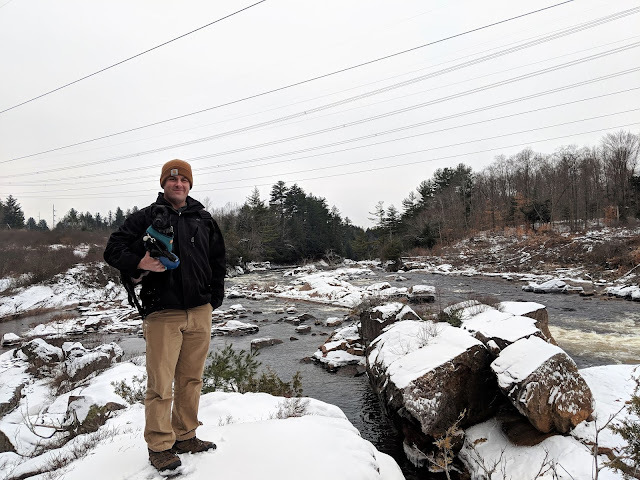 So at the end of December, I packed my bag and the dog and headed north to spend 5 days in the Adirondacks of New York. The Adirondack Park was "created" in 1892 by the State of New York. 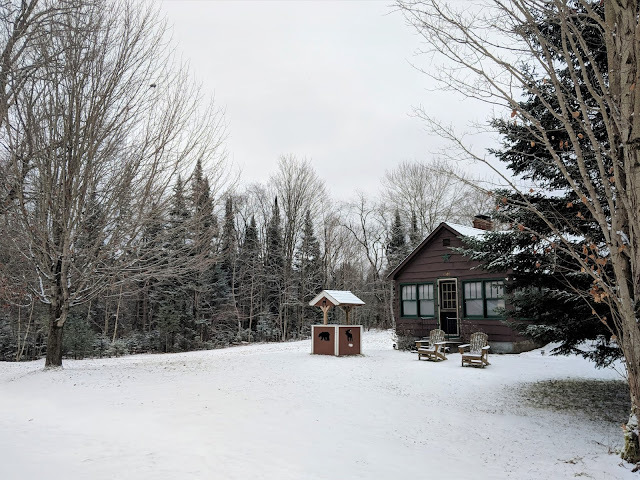 When you think of the Adirondacks, you probably think of the High Peaks Region- of famous Lake Placid or probably even the highest point Mount Marcy. Turns out, the Adirondack Park is so much more than this area as it encompasses 6 million acres - 2.6 million acres of which are owned by New York State while the remaining 3.4 million acres are privately owned. 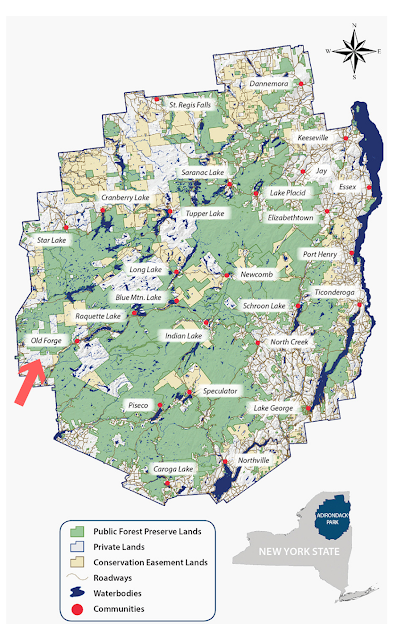 A large portion of the Adirondack Park is also made up of Forest Preserve (which comes with its own land use codes and regulations). This massive State Park is larger than some New England states and is even bigger than some of our famous National Parks. The Adirondack Park contains the largest protected wilderness area east of the Mississippi. In fact, Adirondack Park is bigger than Yosemite, Yellowstone, Glacier, Grand Canyon and the Great Smokies National Parks combined. What does this mean? 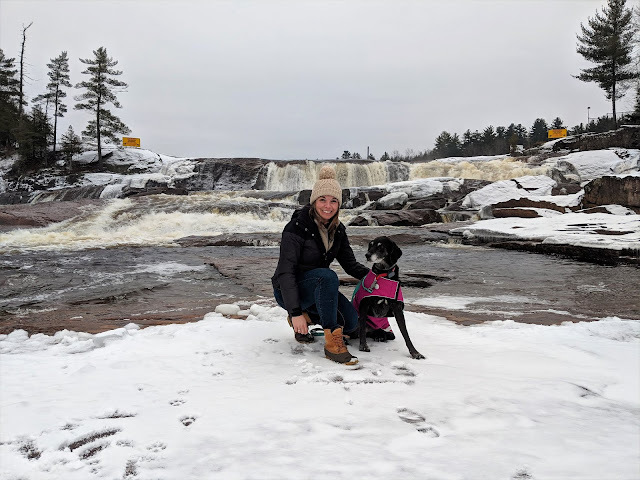 Less crowds and fees, a whole lot of dog-friendly terrain, and a ton of room to stay and play (Visit Adirondacks- where these fun facts were from and where you can find a whole lot more). Truth be told, I never thought much about New York until I took my first trip there this summer to the Ausable Chasm Area and a second trip later in the summer to explore the Catskills. Here in Connecticut, we usually find our mountain solace in Vermont or New Hampshire. But let me tell you, I was enamored with New York and exploring more of this state and the Adirondacks jumped to the top of my "Northeast Bucket List". I wasn't expecting to meet someone who took this interest in New York to a whole new level. Pat, who just so happens to own a piece of this Adirondack Park showed me a part of the Adirondacks I had never even heard of and a part of the state us Connecticutians don't really even know about. 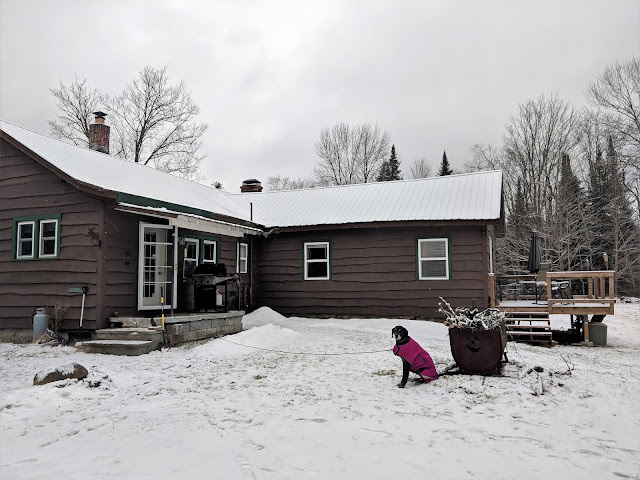 And so, I spent five days exploring the "Gateway" of the Adirondacks, relaxing in the wilderness of some of the lesser known areas inside and outside the Adirondack Park's Blue Line. In the spring and summer months, you can hike the mountains, play in the streams, paddle board on the lakes, and kayak down the rivers. You can camp under the stars and you can drive quads down old dirt roads for miles and miles. In the fall, you can do some premier leaf peeping, lots of hiking, or take part in New York's hunting season. It's a four-season kind of place and I was excited to experience New York in the winter. 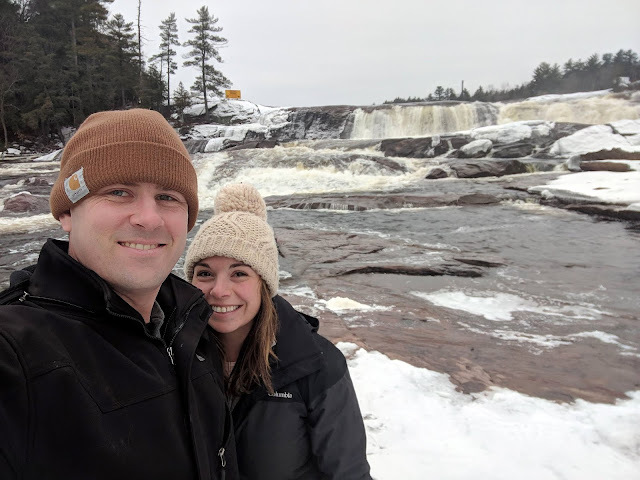 The original plan was to do some snowmobiling, snowshoeing, and cross country skiing but mother nature had different plans. The temperatures warmed and the base layer of snow melted faster than the flurries could layer the ground. Instead of action-packed adventure, it was a slow change of pace. Slow mornings, time spent at the gym, wooded walks with the dogs along the river and out by waterfalls, evenings reading by the fire, and a little pub crawl through this part of New York. While not the trip we intended, it ended up being exactly what I needed to unnerve and to rest, to get my footings back after the holidays and the chaos back home. If you know me, I am a constant over thinker, over planner, over analyzer. So this was a lesson in getting away from my plans, in stopping a bit and slowing down, in appreciating the small little relaxing moments of the day and working on being present. Worrying about next weekend next month or next year is sure to ruin a relaxing day in the woods. So if you feel tired and over-civilized, I strongly encourage you to head to the woods. But if you can't make it there, you can sit back and scroll through my weekend of un-nerving or at the very least, learn a little more about this beautiful part of New York. I was amazed at how many scenic overlooks and picnic areas you can find throughout this area. I am also amazed by the fact that there was never anyone at any of them, even on a holiday weekend. After the gym one day we made a quick stop at this pretty impressive little waterfall in one of New York's state parks. From the parking area, a short trail takes you down to the base of a 50' waterfall. There are picnic tables and grills and not a single soul in sight on a chilly winter day and according to Pat, it is just as quiet in the summer. Old Forge is cited as the Gateway to the Adirondacks and is also known as the "Snowmobile Capital of the East". One night, we found ourselves at Van Aukens Inne to have fun cocktails and listen to some live music at Wakely's Speakeasy. Good music, good company, and an Old Fashioned was my introduction to the town of Old Forge. Our informal "Bar Crawl" also started in this quaint little town. We started at Fulton Chain Brewing where we had a pint of something local before making our way to Matts Draft House at Screamin Eagle (a restaurant, bar, pizza place, and video rental store all in one, you should be confused), Duffy's at the Glenmore overlooking Big Moose Lake, back to Old Forge for the Backdoor Bar (next to the Front Door Diner of course) and ended our night with a Fiddlehead IPA and a mediocre pizza that took a lightyear to make at Otter Lake Station. 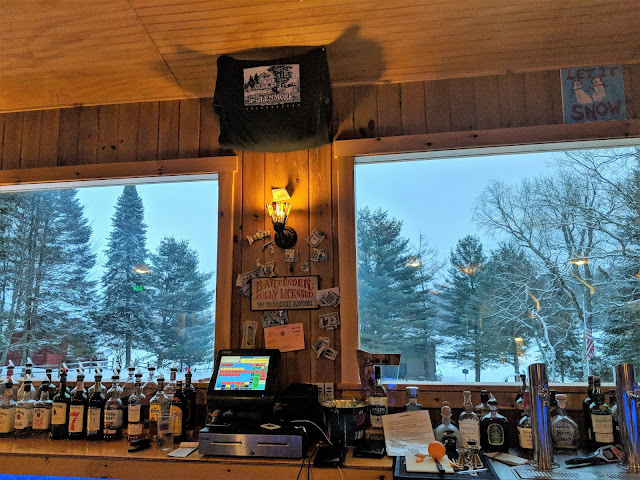 I had a blast getting a taste of some of the local watering holes and checking out a few of New York's quaint little towns, Old Forge included. Home base was back in Port Leyden by the Moose River. 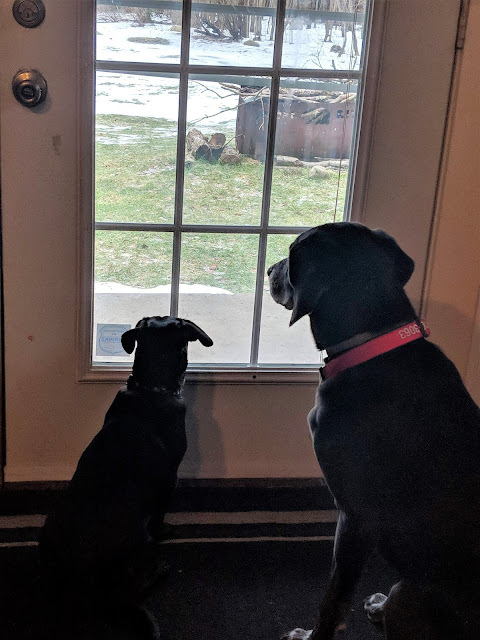 One day, we took the dogs on a walk through the woods, down to an off-the-grid hunters cabin right on the Moose River. It was a scene right out of a movie, quaint little cabin far off the road with nothing around but river. We walked along the river for a bit before turning around and heading back to the house. The Moose River is comprised of three branches- the North Branch, the Middle Branch, and the South Branch. 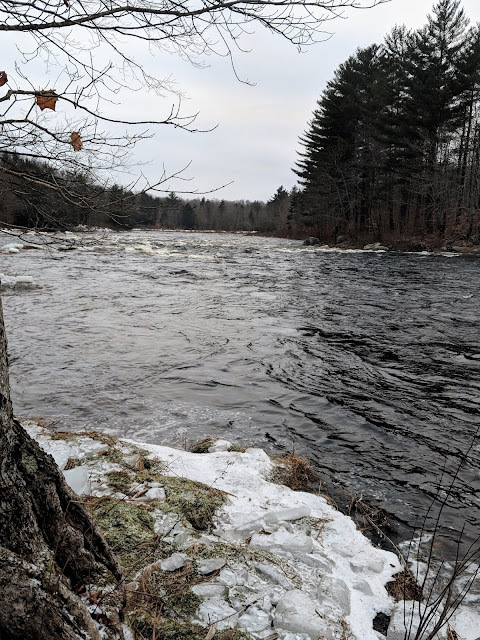 In Lyons Falls, the Moose River joins up (confluences) with the Black River, a 125-mile long river that empties into Lake Ontario. According to my local guide, in the warmer month the Moose River is a great spot to paddle and picnic. Lyons Falls is the name of the 70' waterfall and the village. The quiet village is at the northern end of the Black River Canal which opened in 1855 and was important in shipping/trade to New York and other cities. The waterfall has powered various mills over the years. The Gould Mansion here in town (built in 1902) for a paper industry entrepreneur is listed on the National and State Register of Historic Places. There is a small pull-off area where you can view the falls from above. 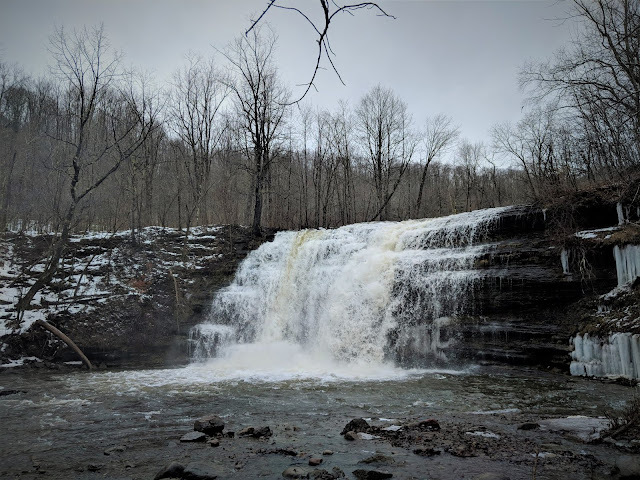 This quaint and relatively easy to access waterfall is the perfect spot to watch kayakers shoot the 18' falls (in the warmer months of course). The falls can be viewed and accessed from within the "Agers Fall's Recreational & Historical Area". The Moose River Trail from the lower parking area takes you to the base of the falls. 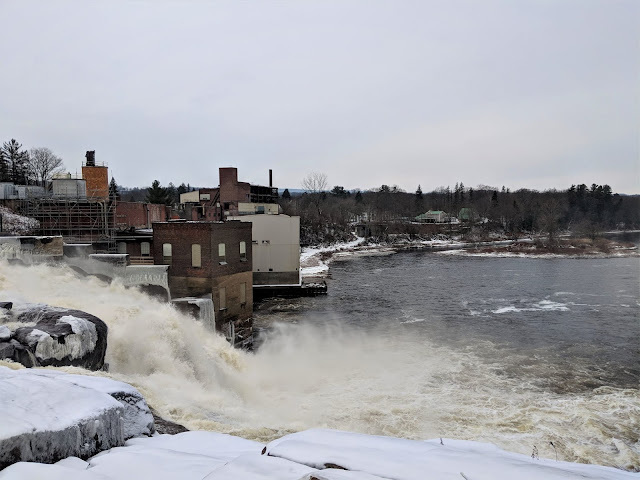 This waterfall located just outside the Adirondack Park is named after Joel W. Ager who built a paper mill here in the 1840s. You will see signs warning visitors to evacuate the area if a siren sounds and signs warning of fast-rising water as there is a power plant and dam just above the falls. This is also a popular picnic area and swimming hole but when we visited, not a soul in sight. More info on hiking trails etc. Pat the part-time local proved to be an excellent tour guide as we continued our way through historic parts of his beloved New York State. As we drove along New York's Route 12 near Boonville, he stopped to point out the old canal system that follows the road. The 77-mile long Black River Canal (an engineering marvel of its time) was built between 1837 and 1855. The Black River Canal ran uphill to connect the Erie Canal with the Black River. Pat told me tales of horses pulling these barges up the canal. After a bit more research, I learned that the canal had an impressive 109 locks along its 35-mile length and remains of several of the canal's former locks are still visible today. You can learn more about the canal and some of its history at the Black River Canal Museum in Boonville. This trip wasn't the winter exploring we had planned, but boy was it a relaxing one. It was a nice change of pace to have a day of no plans and yet a chance to include all the fun featured above. Not featured here was trips to Brantingham on New Years Day to find one (and only one) bar open where we ate wings and drank beer and talked to a New York Native gone Utahn. 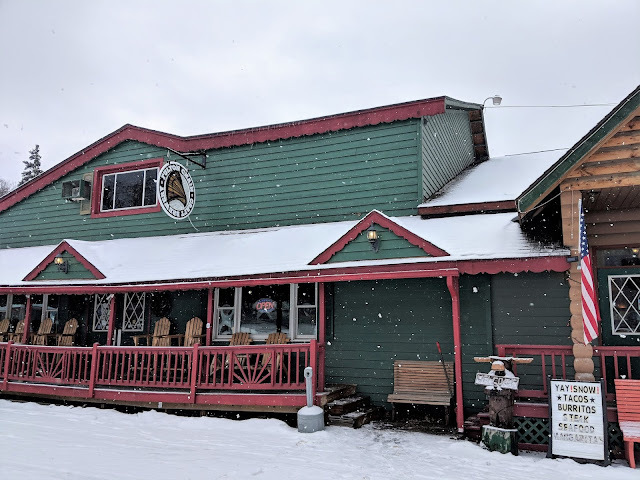 We also spent time at the neighbor's cabin down the road and spent New Years Eve at a beautiful home with some of Pat's friends in Port Leyden. I was able to experience first hand how much the people of this area love this town, and how happy they are to call it home. I was amazed by how damn friendly and happy everyone here was. Must be something about that fresh mountain air and the stillness in the woods. There were also many mornings spent at the gym where I learned there is no smiling in CrossFit and where a certain "coach in the making" questioned my understanding of the terms "Can't" and "Won't". There were evenings spent sipping whiskey by the fire and reading books while dogs snoozed on the couch nearby. There was Saturday night chilli and Sunday morning waffles. There was a mix of sightseeing and movement, time spent with good company, a lovely little house, three dogs, and 5 days of simple relaxation. Thank you, New York for the chance to unnerve and Pat for sharing his little slice of quiet wild heaven with me. Looking forward to future trips back with motorized devices and lots of snow.